No, Beans are not Paleo! Beans are the seeds of large pants from the legumes family. They are summer crops that grow in warm temperature. Beans have significant amount of fiber especially soluble fiber which can help in lowering blood cholesterol. Beans are also high in protein, folate and minerals such as calcium, magnesium, potassium and iron. Beans are commonly used as ingredients to certain dishes. Black beans – From the name itself, black beans are black in color that is oval in shape and has velvety texture and subtly sweet taste. They are available in the market in can or dried. It is also known as black turtle beans. Black beans are normally used in thick soups. 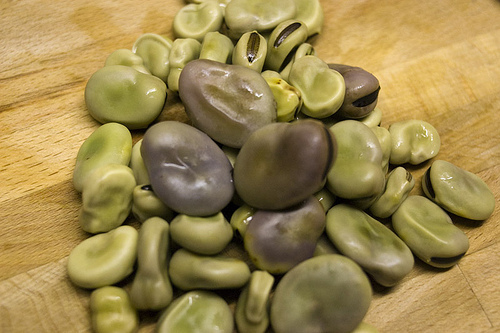 Black eyed peas – These beans are small, plump and have black spots. They are said to be excellent source of folate. Cannellini beans – Also known as white Italian kidney beans, cannellini beans are large and rosy beige in color. They have a delicate, creamy flavor. Chickpeas – It is the most consumed beans. Other term for it is garbanzo. Chickpeas are round and firm and have a nutty flavor. They are used to make hummus. Great Northern Beans – Medium size, white color and oval in shape. These beans have a mild flavor and powdery texture. They are commonly found in dried form. They are often used in stews and soups. Kidney beans – Known for its reddish skin and white interior, kidney beans have a soft texture and full-bodied flavor.They are often used in chilli dishes. Pinto beans – Light brown in color, medium oval in shape, these beans have earthy flavor and powdery texture. Like the kidney beans, pinto beans are also a favourite for chilli dishes. It is popular because of its bicolor appearance. Navy Beans – Also known as pea beans, navy beans are small white ovals with mild flavor and powdery texture. They are excellent ingredient to soups, chowders and bean pot recipes. Reasons Why Beans Are Not Paleo? Beans are technically legumes. And legumes are not and cannot be part of the Paleo diet. Apparently, they weren’t consumed before the agricultural evolution. But this does not justify why they are not accepted in the Paleo community. The main reason beans are not allowed in the Paleo diet is because of the anti-nutrients they contain such as lectins, phytates, saponins and protease inhibitors. These anti-nutrients do not only prevent the body from absorbing nutrients but can also damage the cells in the body. Lectins in beans are associated with chronic illnesses like Crohn’s disease, arthritis, multiple sclerosis, leaky gut syndrome, peptic ulcers, allergies and even Type 2 diabetes. While it is true that soaking and boiling beans can lessen the phytates and lectins in beans, it does not totally wash them out. In addition to the phytate and lectin contents, beans are FODMAPS that contain carbohydrates that can cause digestive problems. It is not good to eat especially to those who already have pre-existing digestive condition. Beans are low in nutrional value. Though they may contain significant amount of protein, they are not as good as most animal food sources. The minerals found in beans are normally blocked by its phyate contents. As we said on our previous post, the nutritional value of beans and other legumes can also be found in meat, fish and other vegetables. Beans unlike peas are hard to digest. If not properly soaked, drained, boiled and slow-cooked, this can cause irritation to the digestive lining. Beans are also high in starch and carbohydrates. Depending on several factors, for people who are not active and have conditions such as type2 diabetes, consuming significant amounts of beans may interfere with weight loss and even cause a spike in the blood sugar. Beans, especially soybeans, contain estrogen mimics that can interfere with hormone function. So there… there aren’t many good things that beans have to offer. So why stick with something that can only do little good but can cause a lot of problems? What Experts Say About Beans… Is It Paleo? The Paleo Diet. Beans and Legumes: Are They Paleo? Mark’s Daily Apple. Dear Mark: Are Peas and Green Beans Healthy? Chris Kresser. Are Legumes “Paleo”? And Does It Really Matter? Paleo Living Magazine. Are Peas Paleo? Paleo Plans. Are Green Beans and Snow Peas Paleo?